With the holiday season upon us, we might be looking to find a sitter for the pets or even a child-minder for that adults-only weekend, but more likely, according to press reports, the top priority is a need for a 'tomato-sitter'. There has been such a surge in people growing their own fruit and vegetables, that now jetting off on a summer holiday has made the need for someone to water the tomatoes the highest priority. Anxious gardeners are so worried their carefully tendered plants will wither or die while they are away they are seeking out the horticultural version of a house-sitter. I'm one of those concerned growers who wants to ensure that all the time I have put into getting those 'toms' to look healthy is not wasted. Press reports yesterday say that almost half of growers are so passionate about their fruit and vegetables they call in a sitter to look after their plants when away. Tomatoes, followed by lettuce, are the most popular choice for the 'Good Life's' Tom and Barbara generation, followed by potatoes beans and peas. I have a greenhouse full of tomatoes and cucumbers and they need regular watering, so I normally 'employ' Guy our neighbour or the son-in-law. Some folk, before they go away, re-pot everything, then plants don't need feeding as they have good compost, but I can't be doing with that and think of the expense. A good grow-bag of three tomatoes, regularly watered twice a week will survive my loving care for a two week vacation. 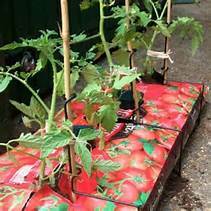 However, tomatoes grown in containers often need watering more than once a day. Self watering devices are also available, if you can afford them. Now who shall I ask to tomato-sit this year?